The Bochumer Verein Verkehrstechnik GmbH provides the content posted on these websites to their customers and other interested parties for general information. The web pages are not addressed to persons in countries that prohibit the provision or the retrieval of the content posted therein. Each user has the responsibility to be aware of and comply with any restrictions prior to accessing these web pages. The subject matter of these web pages constitutes neither an advertisement, an offer of a contract nor financial or other consultation. 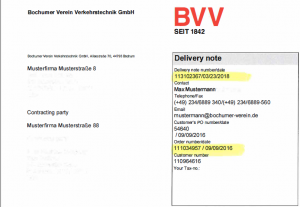 Provision of content on these Web pages or accessing thereof in no way represents a contractual relationship between Bochumer Verein Verkehrstechnik GmbH and the user. The downloading and temporary saving of individual web pages on a computer or monitor is permitted. The reproduction, permanent storage or transmission of content posted on this website requires the consent of Bochumer Verein Verkehrstechnik GmbH.